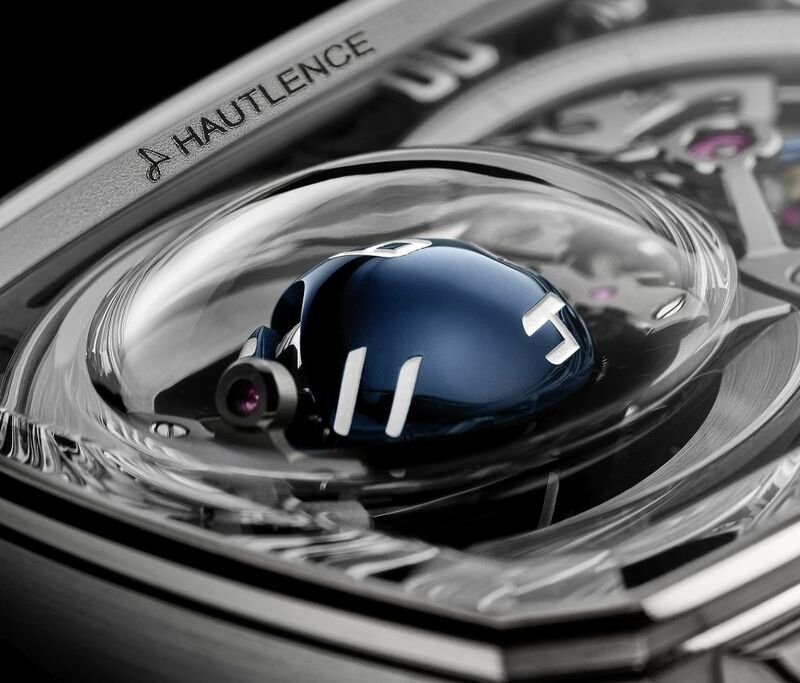 To mark Baselworld 2019, Hautlence is presenting its eighth manufacture caliber and launching an exceptional timepiece: the HL Sphere. The company is reconnecting with its original identity by going back to basics and offering an innovative way to display the time. Following on from the jumping hour disc and the half-trailing hour chain, it now presents a jumping hour that spins on a sphere. 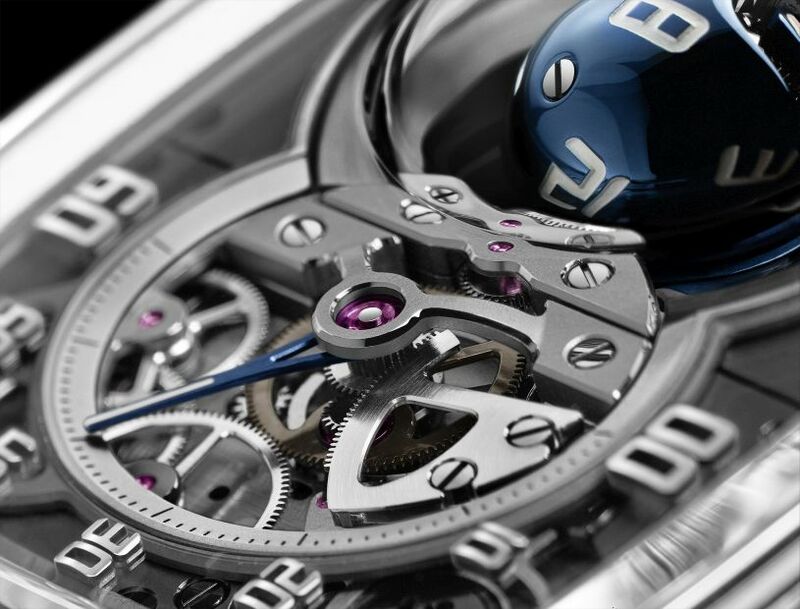 A blue sphere occupies the left-hand portion of the case, magnificently showcased by a sapphire crystal with a small dome. 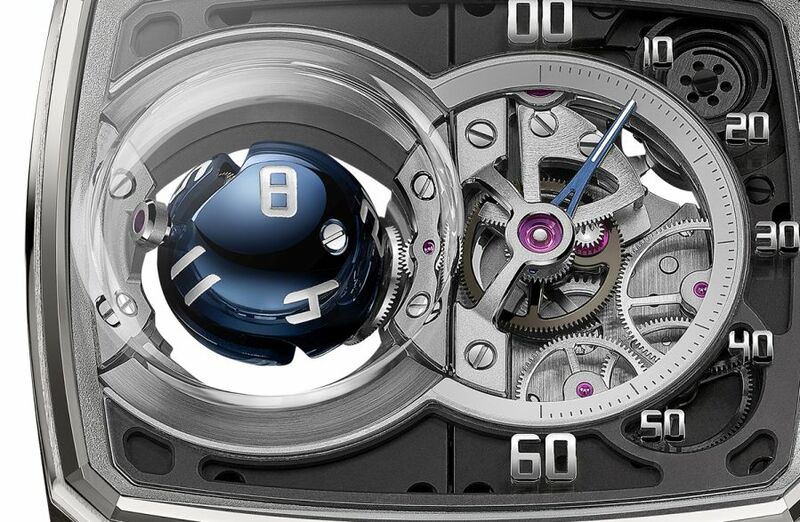 It features twelve engraved numerals and rotates on itself through three rotation axes to reveal the current hour. This display, which initially appears totally random, actually follows a strict choreography, dictated by four conical gears that move around two crossed spindles inclined at an angle of 21 degrees. Two polished titanium cases featuring blue PVD treatment adorn this conical differential to create a "yin and yang" watchmaking composition that forms a sphere. To the right of the sphere is a retrograde minute display with a hand that travels along a fine and minute track that opens onto the movement and partly reveals the balance. 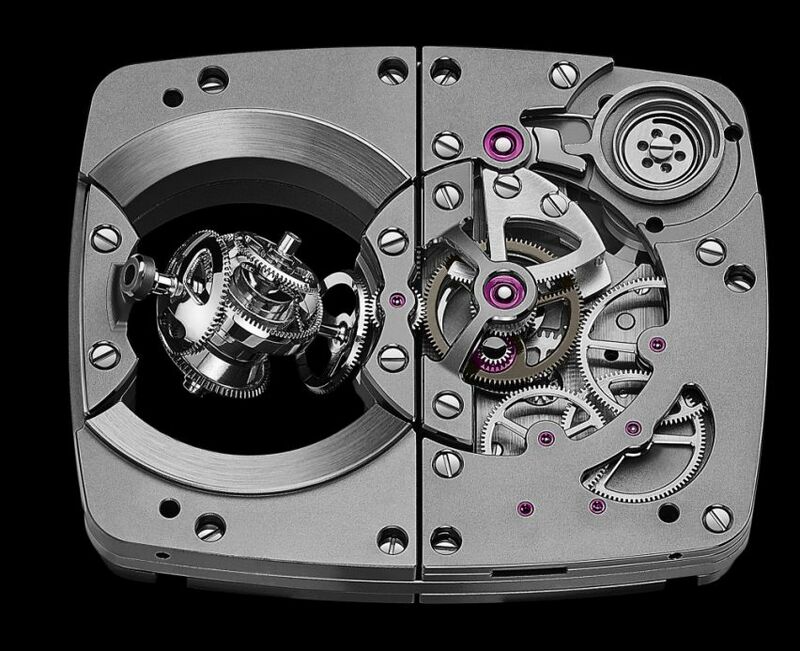 This aperture brings the gear train into view, which slows down the course of the minute hand when it returns to zero, regulating its speed so as to reduce impact forces. The differential and snail used to trigger the jumping hour can also be seen beneath the minute hand. The minute track and the applied silvered diamond-polished minute numerals are fixed to an intermediary sapphire crystal dial with a smoked metallic finish that adds to the piece's transparency. The case, in 18kt white gold, meaures 39mm x 46mm x 12mm. It has a bevelled domed AR-coated sapphire crystal, an AR-coated sapphire display back, and it is water resistant to 30 meters. 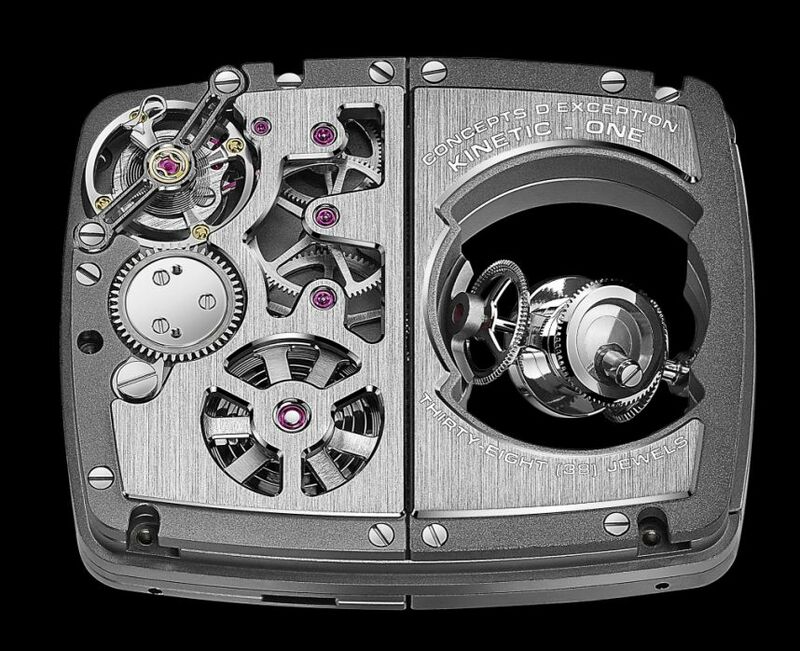 Movement is the Swiss manual-wind Hautlence in-house caliber HTL 501-1 with 38 jewels, 21,600 vph and a power reserve of 3 days. Spherical hour and retrograde minute on a 180° sector. The HTL 501-1 caliber is fitted with a safety mechanism that prevents incorrect manipulation during reverse time setting, leading the movement to simply rotate freely without any risk of damaging the mechanism. Skeletonised balance bridge with proprietary balance spring produced by Precision Engineering, a sister company. Skeletonised drum and ratchet reveal the barrel spring, thereby providing a simple yet ingenious visual indication of the power reserve. Base dial: skeletonised and rhodium-plated with engraved minute track. 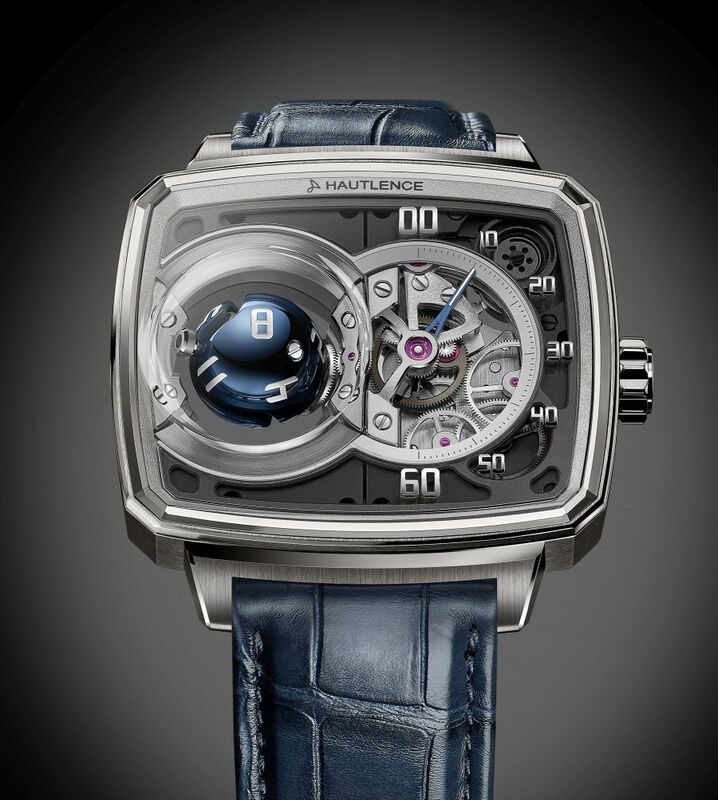 Intermediate dial: Smoked metallic sapphire crystal and curved, diamond-polished rhodium-plated appliques. Hour sphere: Polished grade 5 titanium with blue PVD treatment, laser engraved numerals and white lacquer filling. Minute hands: Satin-finished grade 5 titanium with blue PVD treatment and white lacquer filling. Front face finish: sand-blasted, components decorated and finished by hand. Back face finish: sand-blasted, components decorated and finished by hand. It comes on a domed, rubber-lined, full square scales, rolled-edge blue Louisiana alligator leather strap with a titanium folding clasp.